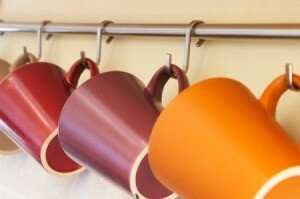 There are a number of ways to organize your coffee mugs, whether you want to display them or maximize cupboard storage. This is a guide about organizing coffee mugs. Save yourself several cup hooks. 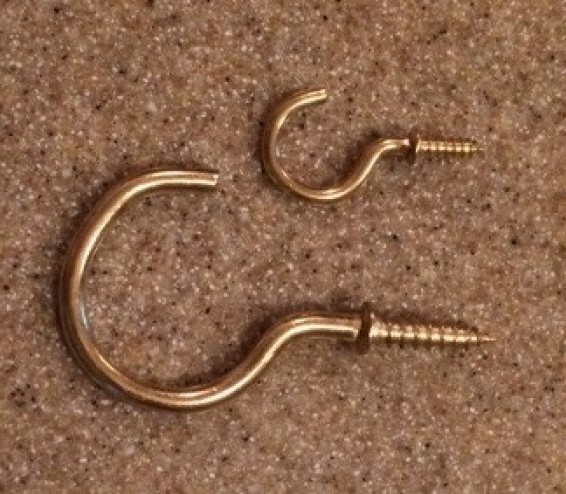 Instead of one hook for each cup, use two to hold a slender rod. I used a disassembled bamboo placemat, cost:$1, and it has been used before for similar needs. 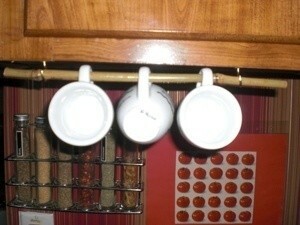 Slip your cups onto the rod and set it onto the cup hooks. I saved one hook on one side of the cabinet and two on the side with four cups! The cups can still be used with very little effort of carefully lifting an end of the rod off one of the hooks and taking the cup(s) off. My espresso cups are seldom used and take up valuable cabinet space so in hanging them for display they are no longer in the way! 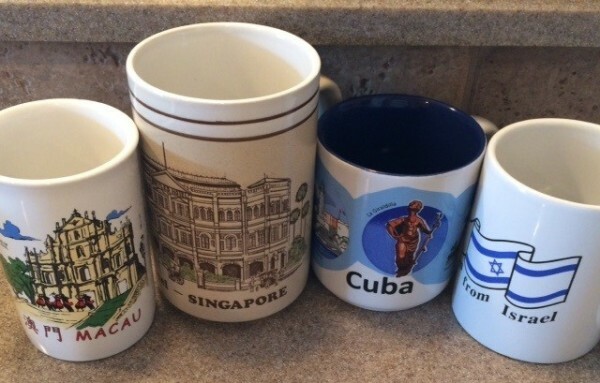 I have a nice assortment of souvenir mugs that I have collected over the years, but all the different sizes and shapes did not fit well in my cabinets. 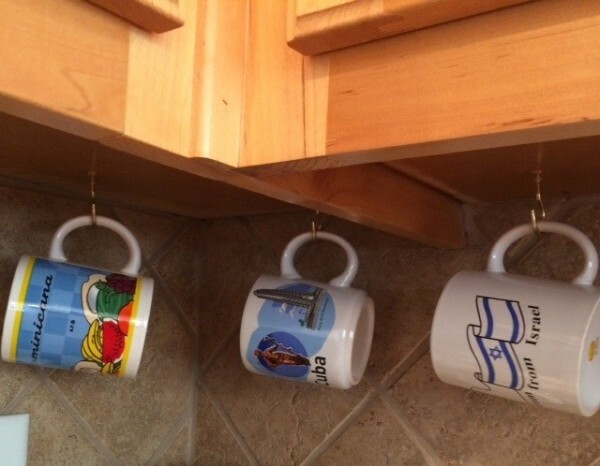 One day it occurred to me to hang the mugs underneath my kitchen cabinets. I started by marking the hook placement on the underside of the cabinet. I decided the hooks should be closer to the back than the front of the cabinet to keep the mugs out of the way of meal preparation. Plan your hook placement based on the length of you cabinets. If you have a corner, it is best to start there. 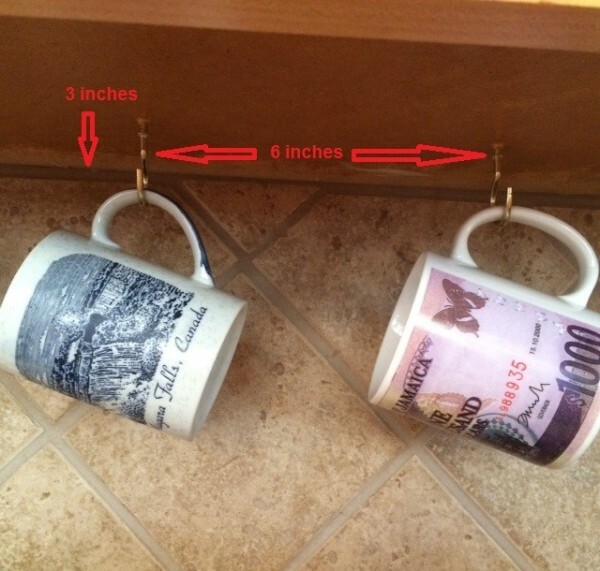 A distance of 3 or more inches from the back wall and 6 or more inches apart allows for placing and removing mugs of various sizes without contact with the wall or other mugs. 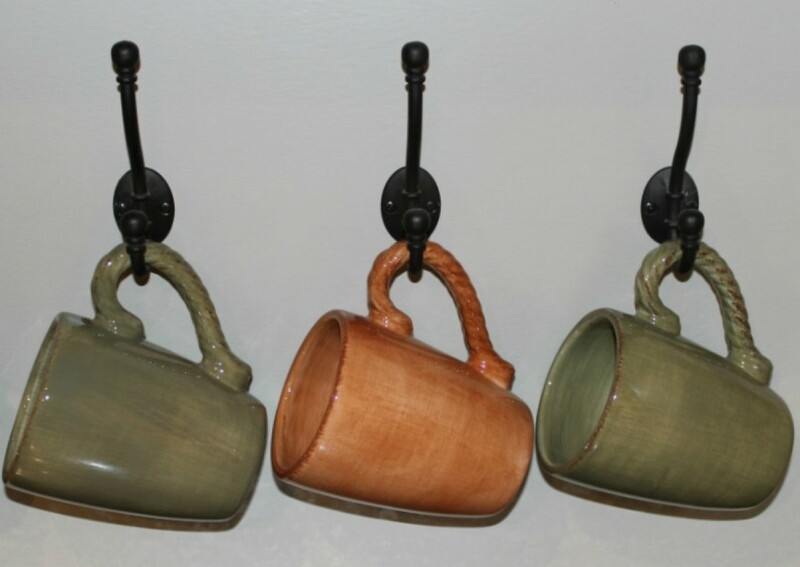 Purchase the larger mug hooks, cup hooks are too small for most mug handles. I now enjoy my mug collection every day and my guests like selecting a mug for their coffee. During the holidays, I replace my travel mugs with Christmas mugs. Maybe you have a couple coat hooks laying around the house, going unused or are just looking for an attractive solution to organizing your mugs. I have several mugs taking up my little cabinet space. Does anyone have an idea for a neat mug rack. I did see the beautiful rack from a garden rake, but I do not have a rake like that. 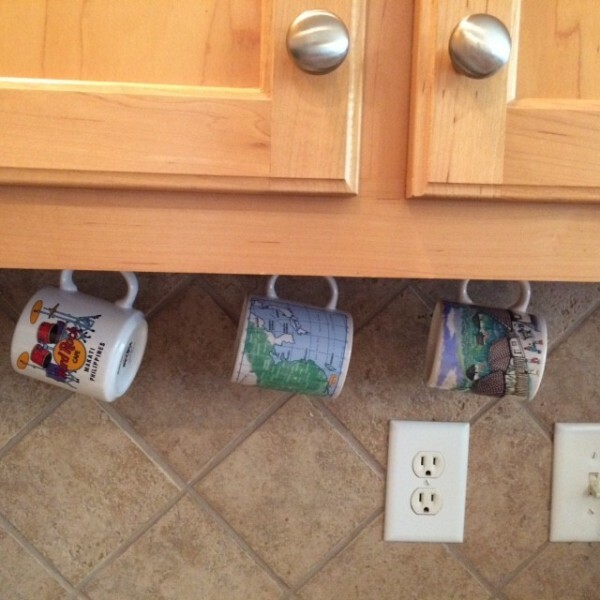 Can you screw cuphooks into the underside of your upper kitchen cabinet and hang the mugs there? My friend did this years ago in her tiny kitchen. It cleared out some shelf space for her but did not clutter her limited counter space. Just make sure the mug handles fit into the size hooks you choose. You could buy some of those cheap coat hangers - those that have three or more hangers attatched. Unscrew the hangers, buy some 1/4inch dowel, drill holes to take the dowel in the hanger about 4inch apart and cut the dowel into 3inch lengths. Now glue the dowel lengths into the hanger, paint the whole assembly and position where you want it and hang your mugs etc. You might find a mug rack at a garage sale or thrift store. Even if it wasn't the right color, you could spray paint it. I think I like the idea of the cuphooks inside a cabinet....that way they stay clean! Screw some hooks underneath the cabinet to hang mugs you don't have room for inside the cabinet. Inside the cabinet door is good for important papers, measuring spoons, etc.